Gaboon duiker, Céphalophe à ventre blanc, Weißbauchducker, Sesi, Seke, Sonde, Tau. A pale forest duiker, typically an overall pale red to sandy brown color. The rump tends to be darker than the flanks. As it's name suggests, the white-bellied duiker has extensive white underparts, including the belly, inner surfaces of the legs, chest, and throat; this pale coloration gradually merges with the red of the back. A broad dorsal stripe of dark brown to black hairs runs along the spine from the nape of the neck to the base of the tail; this stripe is characteristically widest in the middle of the back, tapering to a point at both the neck and tail. In some individuals, dark hairs at the edge of the dorsal stripe give it an indistinct or scalloped border. The tail has a very large tuft of black and white hairs at the tip. The face has a dark blaze from the nose to the base of the horns; this dark coloration does not extend into the coronal tuft between the horns, which is bright rufous. Both sexes have horns, which are stout, sharply pointed, and heavily ridged at the base. 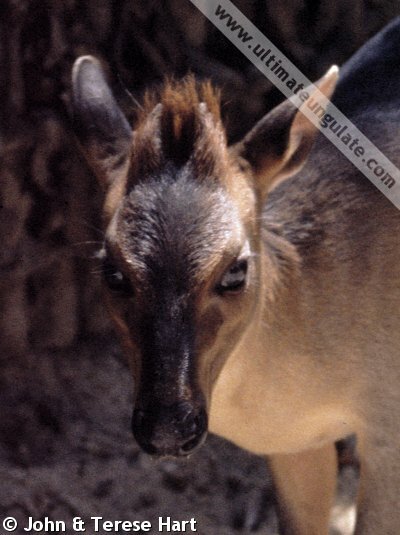 In males, the horns grow 2.1-8.5 cm (up to 12.5 cm); they are much shorter in females, only 0.5-5.3 cm in length. In the field, "red duikers" are often difficult to tell apart due to their retiring nature. 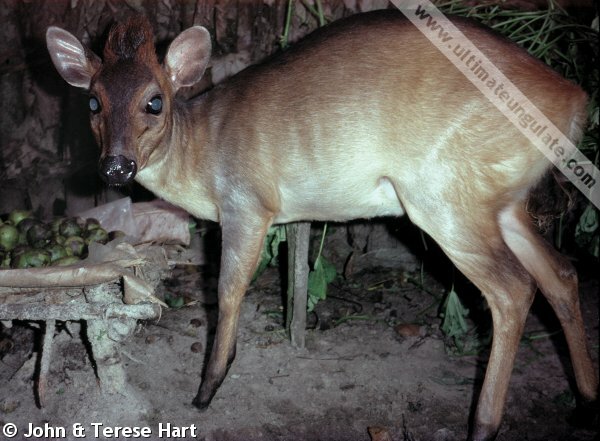 Within its range, the white-bellied duiker's paler coloration, dorsal stripe that narrows at both the nape and tail, and large tail tuft help to differentiate it from other species. The bay duiker (Cephalophus dorsalis) is a very deep red color, and a dorsal stripe that remains the same width along the back until it narrows just before the tailhead. 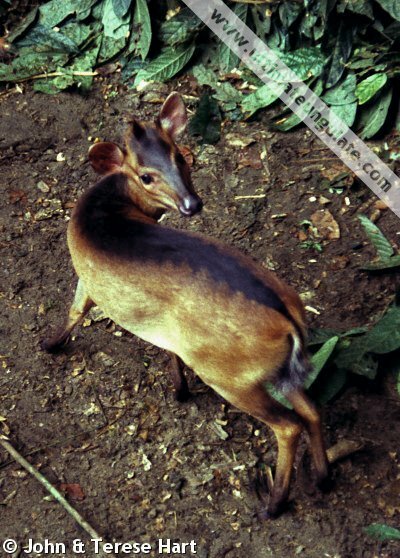 The dorsal stripe of Peters's duiker (Cephalophus callipygus) begins at the shoulders and becomes very wide, covering the entire rump. Both the black-fronted duiker (Cephalophus nigrifrons) and Weyns's duiker (Cephalophus weynsi) lack a distinct dorsal stripe. 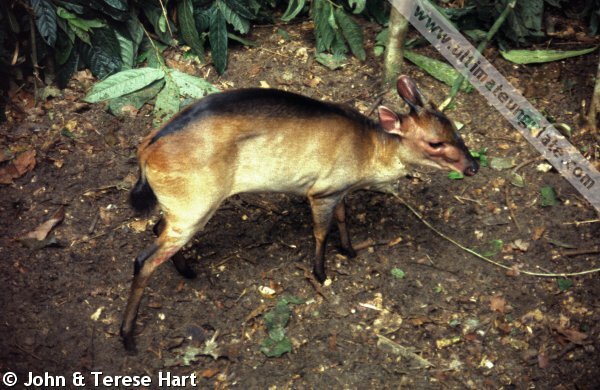 Very little is known about the breeding or development of the white-bellied duiker, although it is likely similar to other Central African red duikers. A large fetus from a hunted female in Cameroon weighed 1.5 kg. Little is known about white-bellied duikers in the wild. This species is primarily diurnal, and will rest between the buttress roots of large trees. When startled, individuals flee into cover in a zig-zagging fashion. Population densities are highest in mature forests with minimal human disturbance; forests dominated by mbau trees (Gilbertiodendron dewevrei) are a key habitat, with up to 9.2 individuals per km2 (densities in mature mixed forests are slightly lower, 3.5-6.0 (mean=5.3) animals per km2). It is surmised that this species might be at a competitive disadvantage in mixed forests where other duikers occur at higher densities. 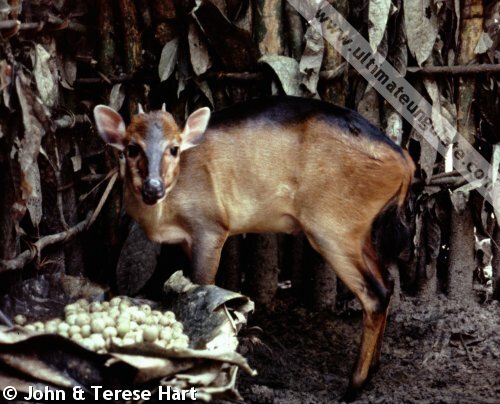 Living under a high canopy, this duiker cannot reach fruit growing on trees. It therefore relies on fallen fruit as its food source, and will often forage under arboreal species (e.g., primates) to take advantage of dropped items. Diet: Primarily seeds and both unripe and ripe fruits, with small amounts of foliage, fungi, and animal matter (insects). Main Predators: Most large and medium-sized predators in its range, notably leopard. Undisturbed closed-canopy forests in the central African rainforest belt. The distribution is disjunct, and two subspecies (sometimes treated as full species) are recognized: C. l. leucogaster from the Republic of Congo west to the Atlantic coast, and C. l. arrhenii from eastern Democratic Republic of Congo. The approximate range is depicted in the map below. Threats: Illegal hunting, as well as habitat loss and disturbance. White-bellied duikers are highly susceptible to hunting; hunters will "call" duikers in using a nasal bleat, and this species in particular will approach closely. They also do not struggle as much as other species in snares, and thus are less likely to break free. As a result, they are one of the first duikers to disappear in heavily-hunted areas. Based on population densities, the estimated total population in 1999 was 287,000 individuals, but is likely an overestimate based on current available habitat and observed rates of decline.